Sugar and caffeine are two of the most commonly used substances in Western societies. Solid evidence supports the conclusion that caffeine is an addictive drug. While the research on sugar is still inconclusive, evidence is beginning to emerge suggesting that sugar might be addictive as well. If you are addicted to one or both of these substance, you can expect to experience withdrawal symptoms soon after you quit. Caffeine is present in coffee, tea, cola and chocolate, among other substances. 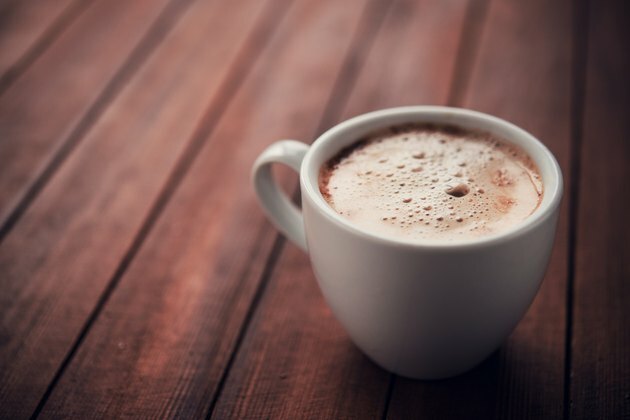 According to the Johns Hopkins Medical Center, 80 percent to 90 percent of North Americans consume caffeine regularly, with an average daily intake of about 280 milligrams, equivalent to 17 ounces of brewed coffee. This level is well above the 100 mg per day necessary to cause physical addiction. The leading source of caffeine is coffee, with a caffeine density per average serving of more than twice the caffeine density of tea and cola. Positive side effects of caffeine addiction include increased alertness, elevated moods and energetic arousal. These effects benefit occasional users, but benefit addicts only in the morning, when the caffeine relieves withdrawal symptoms from the lack of caffeine consumption during sleep. Temporary negative side effects generally occur only after consuming about 200 mg and include anxiety and upset stomach. Caffeine also can decrease the quantity and quality of sleep, according to Johns Hopkins. Like any other drug, caffeine produces tolerance in users, meaning you need higher and higher doses to achieve the same effect. Once you quit using caffeine, temporary withdrawal symptoms set in. Caffeine withdrawal is an official diagnosis, according to the World Health Organization. Its symptoms include headaches, fatigue, decreased motivation, irritability, depression, psychomotor impairment, and in some cases nausea and vomiting, according to Johns Hopkins. The average American consumes about 61 pounds of refined sugar every year, according to Discover Magazine. A 20-ounce serving of cola contains about as much sugar as 16 sugar cubes. Despite it negative side effects, a certain amount of glucose, found in sugar, acts as a fundamental fuel for the body and the brain, according to David Levitsky, Ph.D., professor of psychology and nutritional sciences at Cornell University. Heavy intake of sugar results in a number of negative side effects, including overeating and disruption of the body's energy balance, says Levitsky. Too much sugar also can cause Type 2 diabetes, and can strain the pancreas as it tries to eliminate excess glucose from the body. There is no concrete evidence that links sugar with an addiction/withdrawal system in humans, but studies on rats suggest the possibility. Psychologist Bart Hoebel led a research team at the Princeton Neuroscience Institute that studied sugar addiction in rats. The team concluded that rats exhibit a pattern of increased intake of sugar over time, craving and relapse, and withdrawal symptoms. The main withdrawal symptom exhibited by Hoebel's rats was a significantly debilitating form of anxiety.